As was pretty much already confirmed by Hudson Entertainment, today's VC update brings a duo of well-loved PC Engine imports. Naturally, both of these games cost 700 Wii Points because of import costs! Bomberman '94 is, naturally, the sequel to Bomberman '93. Aside from having quite impressive graphics and sound, the game mostly just expands on what was already there - There's a new story mode and the battle mode has a couple of new features. One of the new features in both modes is Rooi, a kangaroo-like creature which, when found, grants you a special ability plus an extra hit. Bomberman '94 was actually released outside Japan on the Genesis/Mega Drive as Mega Bomberman, but of course only with 4-player multiplayer support instead of 5. Detana!! Twinbee is the fourth game in the Twinbee series, which mostly went unreleased outside Japan. It's also by far the most popular one. As either Twinbee or Winbee, you have to blast your way through six stages of vertical shooting to defeat some aliens and save the Earth. One of the unique features of the game is that you can come across bells - If you hit these enough they'll change colour. Picking them up when they are a different colour will result in a different powerup. Watch out for reviews for both of these games coming your way soon, courtesy of our resident PC Engine specialist, the Corbinator. Nintendo's gone for a week with nothing but Hudson games - This week's WiiWare offering is Pop 'Em, Drop 'Em SameGame, an addictive puzzler which costs only 500 Wii Points. A great week indeed. I wouldn’t mind if Detana Twinbee came over here. No Super Punch Out! !, but at least it's 2 games this week. Great update. Makes up for some of the things we've been getting recently. Bastards. 3 games this week to Europe's 1. Enjoy it NA! I'm hoping we get Bomberman '94 for Europe next week, this game is fairly high up on my list of top games to download! So my fingers are crossed. I'm also hoping that we go back to getting VC titles once a week instead of every other, maybe with the launch of the new DSi this could be possible????? This is a great Hudson update and we get Pop Them Drop them as well. Score one for the Wii-kly update!!! I will downloading Detana!! Twinbee soon. I will be finishing Shining Wisdom first though. Excellent update. Looking forward to picking both of these up later today. 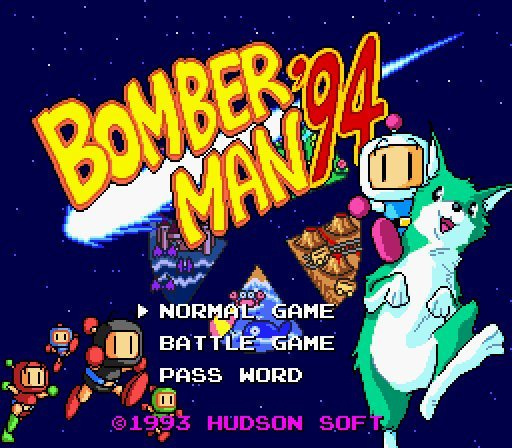 I've heard great things about Bomberman '94 and I'm always up for a good shmup I've never played before. Cool to see two VC games! I really hope we see Super Punchout next week. I hope this is an indication of what's to come for Europe soon, Hanabi-wise. Wow, you could knock me over with a feather right now. Not only did Nintendo release the games promised earlier in the week by Hudson, but there are TWO of them. Can't wait to download Datana! Twinbee later today. So which would you say is better: 93 or 94 Bomberman? This was one of my favorite bomberman games. We used to rent it for the genesis. I'll probably get both of these games. I'm glad we get to see more import games, but I'm honestly don't like Bomberman that much. Twinbee looks like it could be pretty cool, I'll wait and read a few reviews before I decide anything. I agree with some of you that I'd rather see Super Punch-Out but with the Wii version of Punch-Out coming soon it definitely won't be long until we see it released as a virtual console game. They'll do the same thing they did when Metroid Prime 3 came out. I wonder what other imported games we might see. Anybody have some favorites? Oh, I think Bomberman 94 is clearly better. Where's Ginga Fukei Densetsu Sapphire (an ultra-rare TG16 shmup)? I want that game really bad! MethodOne, how rare is it? That would probably be the reason it hasn't been released. For example, Sin and Punishment was no-brainer release seeing how many people imported the game, and games like Bomberman 94 and Twinbee aren't risky sells. A good update, plus we got 2 games for once. Glad to see Hudson back on the bandwagon. I'm seriously waiting for the SD Storage Update. Somehow it's saying April 3rd as Wii Points turn into Nintendo Points. @Spiky Idiot: It's when the DSi launches in your region, IIRC. I'm waiting for the "Storage Solution" myself.... Not to mention the Internet Browser update. Not to mention the Internet Browser update. I hope you don't mean that one that was rumored around November? It turned out that was a fake! Although you can never get enough Bomberman, the latest DS game (as well as the two versions already on the Wii Shop) will suit me fine, thanks. Not a bit update though. Here's to more multiple game weeks. @WarioFan63: I'm wondering if it's the same one... If it is, I had no idea. Mind providing a source just so I can verify if its the same one I'm referring to? @NintendoBrad: Same! I know exactly how you feel. Then again, I had no clue about B94 and B93 was like one of the first games I ever got off the Wii Shop when I got my Wii connected and got Wii Points. Based on the comments so far, I'm thinking it's still worth the plunge. And keep in mind, I have B93 and Bomberman Blast too so you could imagine me being a tad hesitant. I am now more optimistic than ever that we will see Dracula X rondo of blood arrive on the VC. There's a storage update coming next month? I haven't heard about that yet. Well at least the Nintendo released the games that Hudson said would be released this week.GDC 2009 is today as well. Hudson is releasing a WiiWare sequel to Military Madness this summer, which I wrote about in the forums. They are making me happy. Wow it really happened and on a day that the stock market skyrocketed! Detana is fun, I like the PC Engine version more than the arcade, personally. Here's hoping Rondo of Blood is among the next set of Turbografx imports released. I'm sure it'll come eventually no matter what though. No offense but I really hope you're wrong. I don't care very much about these games, but I'm QUITE happy they released games people wanted, and TWO of them! And that Hudson announced them early and they ACTUALLY RELEASED! I would very much like to hear more about this storage solution projection. Haven't seen much on it in quite a while. I'd also like to know about that Internet Channel thing, with debunk proof if possible. I never heard that it was a fake. It just kinda dropped off the radar and I never heard about it again...until now. Well I'm all for Hudson giving us Rondo of Blood before Halloween, but I don't really see that happening. But I hope I'm wrong too. I'm really looking into buying Detana TwinBee, I heard it's a cool game, I'm surprised Nintendo gave hudson a week of their own, it's cool to see the TG16 return this week, however don't expect anything big from next weeks releases, judging by the way ninty acts it'll be a one game week again. I'm also predicting that the Genesis version of Wonder Boy will also be released. More than one game. Check. Games that were previously announced. Check. Actually decent to good games. Check. Are we sure this is VC?? @Obj_Blaster: Heh heh, yeah I'd ask that same question if these titles weren't confirmed already. @touffeboy: Strange. Have you tried DL'ing something else? Does it work? Try reporting it on the Nintendo Support Forums and if that doesn't bring about some results, then call NoA directly. I'm sure they'll help. I wouldn't count on it, At all. Probably the only reason we got 2 VC Games at once was promoted by Hudson themselves, Same thing goes with C64's US VC Boot up. Besides, Was there ever a time when we DID get 3 VC games or more? I'd like to correct two misiformed posts here- one- Bomberman '94 is NOT almost the same game as Bomberman '93. It's as different as Bomberman is from Bomberman '93. Secondly- The Turbografx/Pc-Engine was NOT Hudson's only console- There is the Supergrafx and the 32 bit successor PC-FX. Hmm... I would have rather had Super Punch-Out! !